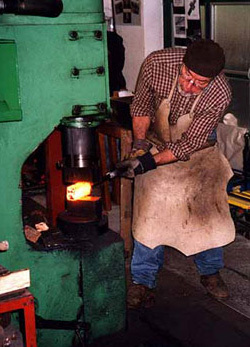 In the Heidenkopf Forge, the ancient forging technique of the historical Damascus forging is practised. Historical objects such as swords, axes and knives, together with modern products such as jewellery, precision instruments, scissors and compasses, and sculptured figures are manufactured using the Damascus technique. In what may be described as archaeological experiments, iron and steel are produced from iron ores by smelting in the bloomery furnace, using processes from the early Iron Age. The bloomery iron produced is then worked by Damascus methods. The practical aspects of these historical topics are covered in detail in Volume 2, ‘The Ancient Art of Damascus Forging.’ Those interested in the history of the Damascus technique as well as novices will find illustrative explanations concerning the arrangement and fire welding of steels to form Damascus patterns. The manufacture and further working of bloomery irons using Damascus techniques are explained with practical examples. Damascus blacksmiths will be guided to success through the accurate forging instructions. A selection of modern steels identified by their international designations and based on their suitability for Damascus working is proposed for trials. The book may be ordered directly from the author  with a dedication if desired. The published work has been well accepted in expert circles, by blacksmiths and by readers interested in historical iron production.On the general topic of Damascus production, there is an exhibition consisting of large format colour pictures and manufactured objects, which show the various stages of production. Slide shows with either 35 mm or 6x6 transparencies are available for special topics. Exhibits and photographs are continuously up-dated and are offered for lectures and temporary exhibitions.